Yesterday (a monthly Wednesday) we worked on the quilt that Sue Kerton and others are making for an acquaintance of hers, to raise money for the refuge. 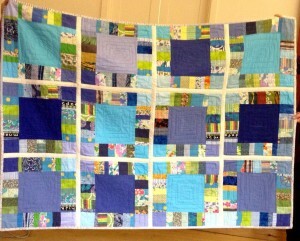 The quilt top is coming on apace. Also yesterday I handed over some quilts and cushions we had made to the Stroud Furniture Project to make the homes of our Syrian refugees more comfortable. We have another box of fabric lengths from Lorraine Pugh for sale. Many pieces are big enough for a modest-sized quilt back. Ask Fran if you are interested. There are two exhibitions at the City Museum in Gloucester (Gloucester City Museum, Brunswick Road, Gloucester GL1 1HP) that might be of interest. A fascinating collection of over 40 works, showcasing the medium of art quilting as a form of modern art. The exhibition has toured all over Europe and has been met with rave reviews. A fully illustrated exhibition guidebook will be available throughout the exhibition period, at a cost of £10. The Tudor Child offers a detailed insight into sixteenth century clothing for infants, young children and youths. Featuring beautifully handmade costumes and replica fabrics of the period. Visitors will have the chance to learn how to ‘swaddle’, whilst hearing how boys in skirts and young girls in stiffened bodices were the norm of the day.